The Justice League has successfully escape from the Watchtower in space and teleport to S.T.A.R. Labs in Metropolis, but Brainiac detects their signature and decides to eliminate the League by using his ship's tractor beam to bring what's left of the Watchtower down on Metropolis, wiping out millions including the heroes. But first, he must alert Lex Luthor to leave the area right away. The doctors at S.T.A.R. Labs start fixing up Martian Manhunter and wonder how he could have been injured so badly. The Atom explains that Brainiac's nanomachines were able to steal abilities from the heroes and that Aquaman was also injured. Which reminds Superman and Batman that Aquaman is still on the exploding Watchtower that's falling to Earth. On the Watchtower, Aquaman escapes from his water containment unit and hopes that if he can make it to the teleporter, that there's still a power supply to send him home. Brainiac continues to search his ship for Luthor, Atom and Black Canary when he realizes what Luthor's plan must be. He's heading for the trophy room to steal Sinestro Corps power rings from the dead in the bottled city from Korugar. In the miniature city, Black Canary and Atom each take a ring, while Luthor takes a total of eight, one for each finger. They speak the Sinestro Corps oath and power up the rings before returning to the trophy room and taking on Brainiac's advancing robots. Luthor orders the two to retrieve the canister containing all the exobytes Brainiac used to rob Earth's heroes of their powers so they can empower what's left of the human race with superhuman abilities and defeat Brainiac. Luthor himself goes straight after Brainiac. Luthor hears that Brainiac intends to destroy Metropolis and commands that their deal will be off if he allows this to happen. Brainiac lies and explains that this is all Superman's fault. At S.T.A.R. Labs, Batman discovers that the wreckage of the Watchtower is falling directly toward their location and that there's still a life sign in the biggest piece that must be Aquaman. He tells Wonder Woman, Green Lantern and Firestorm to take care of the smaller fragments while Superman rescues Aquaman and throws the biggest piece back into space. As it space station enters Earth's Atmosphere, Superman breaks through the wall, grabs Aquaman's hand and breaks out to the other side and sets him in Hob's Bay before returning to catch the wreckage. While the others catch their pieces of Watchtower, Superman finds that his larger piece is much heavier than it should be because Brainiac is using his tractor beam to push it harder and harder. Superman soon realizes that there's no way he can stop the impact, but he can push it to Industrial Park where casualties should be minimal. Unfortunately, while trying to escape the carnage, Luthor went to the same industrial area. He barely survives the impact, but has been impaled by sharp metal spikes and has lost his left eye. With his remaining eye, he sees Superman crawl out the debris and yells, "You!!! ... You did this to me!!" 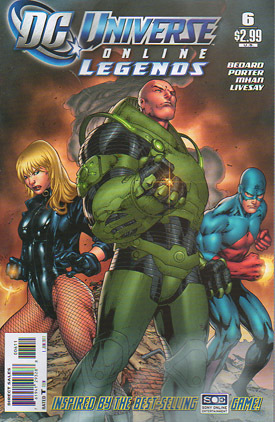 Black Canary and Atom find the canister with the exobytes while Luthor finally confronts Brainiac. But he's overconfident and did not realize that Brainiac has a fist full of Green Lantern power rings. The fight is short. The heroes and villains below simply see Brainiac's ship ripped apart by brilliant beams of green and yellow. Atom manages to protect the container, but lands on metal spikes that impale his chest and neck. Black Canary sees him die before passing out. Brainiac lands and yells out for Luthor while using his Lantern rings to take on Powergirl. Luthor has landed as well and sees that Atom's belt buckle is beeping. It's his Justice League communicator and Batman tells Luthor to come immediately to his coordinates. It's Superman's Fortress of Solitude and he thinks he has found a way to undo Brainiac's invasion. Story - 4: This is the climax I was hoping for, even though it's obvious where the plot is going at this point if you've seen the end of the game's opening video. As far as I can tell, this is the end of the first story arc, but clearly not the end of the story. The fight in the future was epic and it paid off many of the story elements proposed in the first several issues. Once again, anybody can die in this story and we have officially lost Rap Palmer: The Atom. It's unclear if Powergirl or even Black Canary have survived, but they probably have. The big reveal of Batman at the end is excellent. The first video update from the game already revealed that he survived the battle from the start of the game, but that video will most likely take place chronologically some time over the next several issues. In the past, the big revelation is that Luthor blames Superman for the loss of his eye as well as other major injuries. As if Lex needed more reason to hate him. Even though the fault is Brainiac's, Luthor has still been led to believe that this was Superman's doing. Plus ultimately Superman did decide to push the wreckage toward that area, even though it was to save the rest of the city. It has been four issues since Lois and the entire Daily Planet building were taken out into space and nothing has been mentioned about it since the first pages of issue 3. It's time to deal with that part of the story. Yes, these are bi-weekly books so it's only been two months, but that needs some sort of mention soon. Art - 3: This simply comes down to not being my style. The art isn't bad, but feels wonky in certain parts. The human faces tend to lack detail and for some reason Black Canary just looks odd in every panel she's in. The coloring and effects, especially involving the Green Lantern and Sinestro Corps ring constructs look great. When Superman rescues Aquaman and puts him in the bay, the underwater panels look amazing. 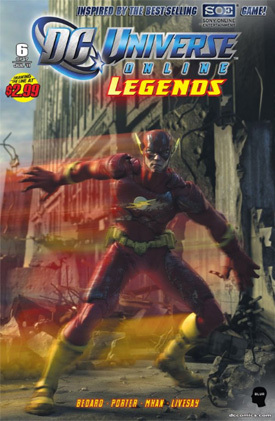 Cover Art - 4: This is very similar to the cover from issue 2, but Black Canary, Lex Luthor and The Atom stand in the place of Wonder Woman, Superman and Batman respectively. Plus they have clearly achieved their goal of obtaining the yellow Sinestro Corps rings and are now prepared to take on Brainiac at full strength. Digital Cover Art - 5: Another big hit for the digital covers. These should be the direct market covers at comic shops. There have only been a few "misses" and minor imperfections, but they're mostly excellent. The Flash looks perfect here and the background of Metropolis in shambles in the middle of a battle is outstanding.